Our casita is situated in a typical Spanish village. and one with two beds, sleeps 2. There's a folding bed in the livingspace where there's posibility to sleep 1.
equiped with oven, cooker, dishwasher, coffeemaker, microwave, fridge freezer, washing machine and tumble dryer. there are al sorts of pots and pans, plates, cups; bowls, glases and also wine glases and cava glases. We provide olive oil, vinagre, salt and pepper to cook, tablets for the dishwasher and detergent for the washing machine, also detergent to wash the dishes. Kitchen towels and guest towels are also provided. The interior is well furnished with a corner salon, buffet drawer, table and four chairs, special lighting and there is garden furniture and lights on all the terraces and sunbeds and lights on the solarium , there's also a shower outside on the back terrace; we provide also a cot and childrens high chair if necessary. 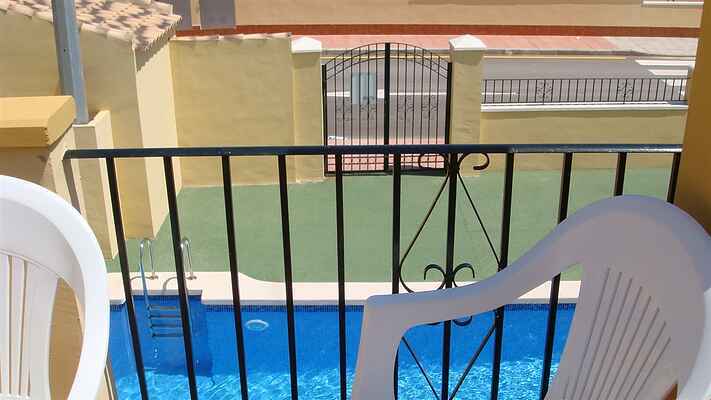 There are 4 swimming pools in the complex, where you can enjoy swimming till late and one of them is next to our casita, with the entrance only 7 meters away; there is also a golf nearby. In La Union town of flamenco and old mining sites, there's always something to do, visit the antique Mercado, the calle mayor with its shops; bars and restaurants and the old mining sites, there is also a big weekly market on tuesday till 14h00 or later, where you can buy clothes; accessories, Spanish souvenirs and food. If you like markets, there is also a sunday market in Cabo de Palos. Every year in august there's the flamenco festival, you should not miss it ! For the culture and shops, you can visit Cartagena, that's only 5 minutes away. There's a big shopping center "Parque Mediterraneo" in Cartagena, only a five minutes drive, here you have a hyper Carrefour, Leroy Merlin, Mediamarkt, Worten, Decathlon, da Costa's, Casa, Feu Vert, and a big indoor shopping center with all the usual shops for clothes shoes, perfumes, a bowling center; a Big Wok where you can eat for € 8.95 as much as you like ! an Italian restaurant with enormous choice, and various Spanish restaurants and hamburger resto's. La Union is situated close to the motorway, so you're everywhere in no time at all. La Manga strip is only 10 min. away, there you can enjoy both seas; and you also can visit Cabo de Palos, where there are also plenty of restaurants on a nice promenade. The MAR MENOR, the little sea, is a blessing for your health with the salt water and the mud baths that you can take there. A "welcome pack" consisting of milk, eggs, bread, butter, water, tea and coffee, sugar, jam and some fruit can be provided at an additional charge of € 15 to be payed with the balance paiment. just ask for it when you email me. There is an airport in San Javier Murcia at 20KM, where you can travel to by RYAN AIR, JETAIR, and others. in both airports there are plenty posibilities to hire cars, Centauro and Goldcar are the cheapest. just look on their websites. If you don't want to rent a car, we can arrange transportation to the casita for you for an additional cost. In the summer months we welcome you with a bottle of cava in the fridge ! on the house ! warm welcome from Nadine and Ivan !